I come from a big family. I’m the second of six, with one older sister and four younger brothers. With spouses, grandchildren and great-grandchildren, plus my parents who started it all, we now number 31. Last week 25 of us gathered at the Outer Banks of North Carolina for a sensational family reunion. I was reminded again how important it is to take a break from work and my day-to-day routine…and how lucky I am to belong to a family where love, support and mutual respect are the cornerstones. 1. Pitch in and help out even when it’s not your job. Each sibling’s family was responsible for preparing one of the evening meals – no easy task when feeding so many people. It was gratifying to watch how others pitched in to set the table and clean up afterwards, which made the workload less daunting for the responsible individuals. Insight: You never hear members of a high-performing team say, “That’s not my job.” They’re constantly on the look-out for ways they can help each other. 2. Be willing to get outside your comfort zone to try something new. One of my relatives brought a karaoke machine and was eager for us to try it out. When I first heard about it, I thought, “Not me. I’m not standing up in front of everyone and making a fool of myself.” But it turned out that my fears were unfounded. What actually happened is that we all stood around facing the screen and we sang together as a group. The more daring ones held the microphone so their voices came across more strongly, while the rest of us sang along and danced to our favorites. It was great fun, and we laughed a lot. Insight: At work, keeping an open mind is essential to discovering better ways of doing things. And being flexible about shifting gears or moving in a new direction can lead to an even more positive result than you imagined. 3. Recognize that mistakes are inevitable and get over them quickly. We rented kayaks for the week. I took one out in the ocean after two family members had seen dolphins up-close the previous day. I was hoping I’d get lucky, too. I maneuvered the kayak successfully through the incoming waves as I paddled out to the open water. And I even calculated what I needed to do to keep the kayak perpendicular to the shoreline as I was coming back in. But I didn’t see the wave coming up behind me. It crashed over me, tossing me into the water and turning the kayak over. One of my brothers swam out to help me. No dolphins and no smooth re-entry for me that day. Insight: Mistakes are going to happen when a team is working hard to get things done. So when you do make a mistake, the key is to learn what you can from the experience and then let it go. When you beat yourself up for your imperfections, you waste valuable time and energy that could be spent doing something productive. 4. Never underestimate the power of positive role models. My parents are the reason our family shares such a close bond. They set the stage early on by showing us what a loving relationship looks like and teaching us the core values essential to a fulfilling life – integrity, self-discipline, cooperation and responsibility. It’s heart-warming to see these same ideals reflected in three generations. What a legacy they are leaving this world. Insight: While the leader does set the tone, every person on a team can have a positive impact on all the other members. Your value-driven words and actions inspire others to respond in kind, creating an environment where people are eager to contribute their best. No matter what your position, it's possible for your behavior to make a positive, lasting impression on everyone who interacts with you. Lovely post, Meredith. So true about the lessons we can learn from family. And how lucky you are to experience all this with yours. Wonderful picture, wonderful insights! Thanks for dropping by and sharing your positive feedback, Pam. I really am very lucky to be part of such a loving family. Great post. Thanks for sharing those thoughts. Those are great insights, and it's clear what a great time your loving family had with each other. We're happy to know that y'all chose the Outer Banks for your reunion. If you plan on heading back, we would love to help you plan. Please let us know if we can help with next trip to the Outer Banks. Inspirational post. 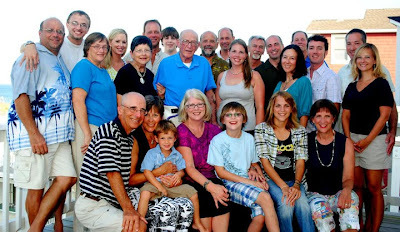 My family is planning its first ever family reunion for June 2011 & I'm looking forward to getting reacquainted with family members I haven't seen in a long time. Meredith--wonderful insights about some of the highlights from the week! Thank you for sharing and for being an important part of my many great memories from our time together. Seaside Vacations, I appreciate your comment and will keep you in mind when planning future trips to OBX. Lita, Very exciting for you to have that reunion to look forward to. If you can find a way to start connecting with people throughout the coming year, you'll arrive with a strong bond already established before you start the week. Cory, Loved the time with you and your special family. I appreciate your positive feedback, and I look forward to creating lots more memories! Great post and lovely parallels drawn here. I think leadership which is grounded in the reality of daily life is truly authentic. I have only been to a few reunions when I was younger but love big occasions when families get together like weddings, birthdays etc. This year my dad is 80 and we are planning a big party. Ali, we recently celebrated my dad's 89th birthday and 22 family members were there in his honor - almost as many as at our "official" reunion! I agree that big occasions to celebrate important milestones are wonderful. They create special memories that we cherish the rest of our lives. I appreciate your positive feedback, and I hope your party for your father is a huge success! Great post Meredith. Love the Outer Banks and your tips! Thanks, Craig. I appreciate your positive feedback and knowing we both enjoy OBX!